If you're like many Americans, you may be making fewer trips to the bank and instead taking care of check deposits with a mobile app or tracking account balances with a few mouse clicks. Digital banking is undeniably gaining ground over the old brick-and-mortar process. But about 84% of banking customers still visit branches at least occasionally, according to a March 2016 Federal Reserve report. For example, you may want to talk to a rep in person to ask about retirement planning, sign mortgage papers or connect with someone about a financial decision. Today's bank branch, though, may look more like a coffee shop or a modern boutique than a traditional marble affair. Cafes that sell pastries, stores with yoga rooms inside, postage-stamp-sized branches: These are some of the innovations that may become common in the bank branch of the future. 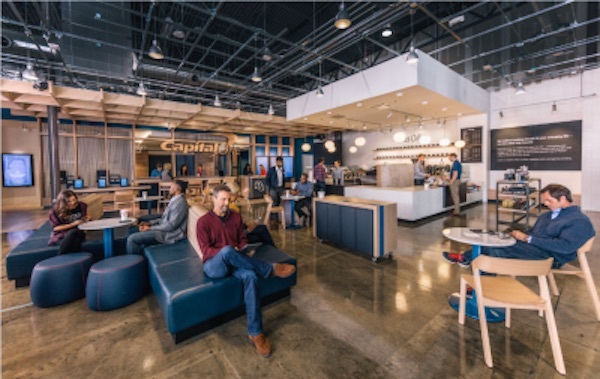 Capital One has begun using cafe-style branches, as pictured at top, to promote its brand as an internet bank and keep in touch with customers. It has 10 cafes in Boston, Chicago, Los Angeles and other cities. The cafes have no teller windows or marble columns. Visitors can use free Wi-Fi or buy a cup of Peet's coffee and pastries from local bakeries. They can work on their devices, lounge around or recharge their phones. Staffers called "coaches" and "ambassadors," rather than tellers and bankers, answer questions and demonstrate online banking or banking apps on a tablet -- but they promise not to initiate any financial conversations unless the customer asks first. "No one is going to nag you about setting up an account," says Courtney Rhodes, corporate communications manager for Virginia-based Capital One. "People can work there all day if they want. And those with Capital One accounts get discounts on coffee." Capital One will open two cafes in Washington state in 2017 and has plans for more in Denver; Richmond, Virginia; and South Florida. Umpqua Bank tries to make customers feel comfortable with making money decisions by offering a friendly, less-intimidating banking environment. The Portland, Oregon-based company took inspiration for its branches from the hospitality and retail industries. "We call our locations 'stores,'" says Eve Callahan, the bank's executive vice president of corporate communications, who lists the Ritz-Carlton, Four Seasons, Nordstrom and Gap as influences. The bank's modern-looking locations mix hotel-like elements and retail ones. Customers are offered free coffee, chocolate coins and cookies, and can browse products for sale from a rotating roster of local companies or use a free reading library and meeting rooms. 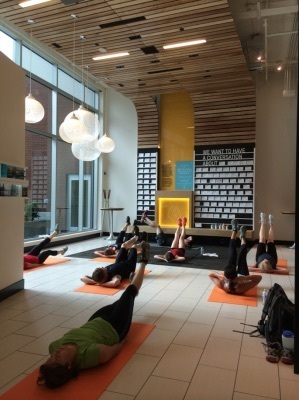 "We host events in our stores like yoga classes and movie nights for kids," says Callahan. "The store is a place for people to come browse, shop, enjoy free Wi-Fi or sit and read. It becomes a community hub." Just as economic constraints gave rise to the tiny house movement, cost-cutting measures in the financial industry gave rise to the idea of tiny banks. After all, smaller branches are less expensive to build and need fewer people to staff. 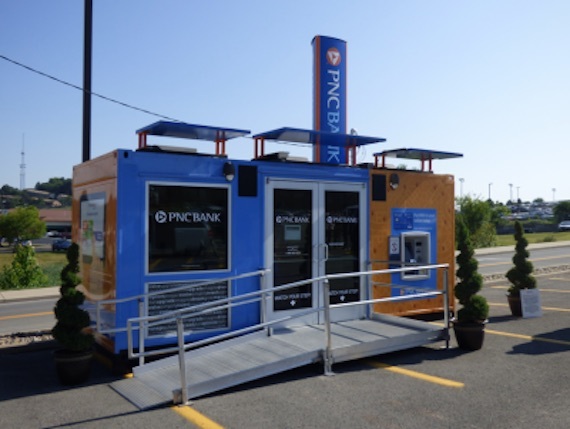 In July, PNC Bank opened a mobile pop-up branch created from a storage container on the campus of West Virginia University in Morgantown, West Virginia. Bankers inside and around the structure use tablets to help customers. The 8-foot-by-20-foot branch also has visited Atlanta, Chicago and Charlotte, North Carolina. "We would be on a picnic bench showing the Money Bar or Punching the Pig under the cover of a shade tree," says Mike Walters, network transformation manager at Pittsburgh-based PNC Financial Services, referring to two of the bank's digital tools for tracking and saving money. Though it's small, the branch offers checking and savings accounts, credit cards, loans and help with retirement planning. It has high-tech ATMs that accept checks and cash for deposit without envelopes, and can cash checks on the spot. If you insert a check for, say, $311.75, the ATM spits out $311 in bills and deposits the remaining 75 cents into your account. Walters says they are testing ATMs that also will allow coins to be deposited and withdrawn. Massachusetts-based Eastern Bank has a 350-square-foot "micro-branch." Instead of doing transactions through an old-fashioned window, customers sit side-by-side with bankers on couches, using laptops for transactions. With transactions going increasingly digital, physical branches remain the only way financial institutions can deliver the human connection that many consumers still want. That's important enough that banks appear willing to go the extra mile to make sure their branch experience is a positive one.